Skin feels hydrated, smooth and wonderfully protected. 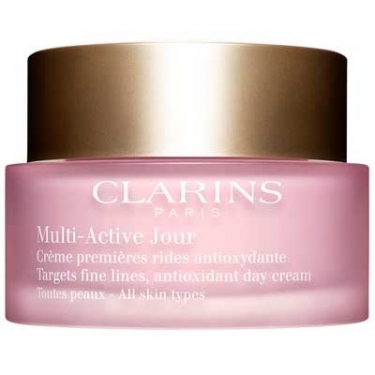 Multi-Active Jour Créme Lissante Rides Précoces is a wrinkle correcting cream infused with age-defying plant extracts that go beyond prevention, correcting first lines and wrinkles. This anti-aging formula neutralizes the harmful effects of fatigue, pollution and UV rays, unveiling a l hydrated, smooth and wonderfully protected complexion. Use each morning after Multi-Active Skin Renewal Serum with gentle upward motions to perfectly cleansed face and neck.